While some are hoping to get big bucks for early Civics, the harsh reality is that lovers of vintage Japanese iron haven't really embraced the little car that changed the entire automotive landscape during the Malaise Era. 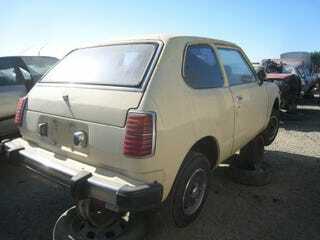 That means that plenty of fairly solid 1970s Civics go straight to the boneyard as soon as a $300 problem crops up. I think it's a shame, because most of the Civic's competition back in the day (e.g., Corolla, Pinto, Colt) tended to be several notches below the Civic in the "fun to drive" category, and even Toyota felt a bit threatened by the Honda's reliability. I still recall feeling humiliated, 20 years ago, that my girlfriend's '73 Civic could eat up my '73 MGB-GT in every category from acceleration to braking to electrical-system quality (yeah, the last one is a fish-in-a-barrel deal). Here's one I spotted in a nearby self-service yard a few weeks back. Is that 97,000 miles... or 397,000 miles? The interior was pretty decent, so I'm guessing the lower number is more likely.